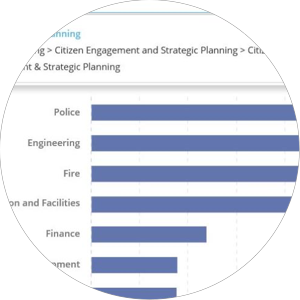 Get everyone to understand the great work your city, agency and state is doing using Questica's budgeting, performance and transparency software solutions. The future of public sector finance is transparent and accountable. Questica OpenBook can help you build transparency and trust with your stakeholders by communicating with easy-to-read visuals. Showcase your financial and non-financial data with interactive charts, tables, and graphics with descriptive text, informational pop-ups. Your stakeholders can easily find out what they want and need to know about the government’s plans, projects and issues in their community with OpenBook’s searching and filtering options. Explore OpenBook sample visualizations now. Communicate with councils, boards, staff and citizens like never before. Sample data visualizations are available on our Open City website. *New* Project Explorer for Capital Budgets: Put all your capital projects (budget, images, docs, video) on an interactive map. OpenBook can help you engage more effectively to tell your story. Transparency enables better ideas, better conversations and better financials. 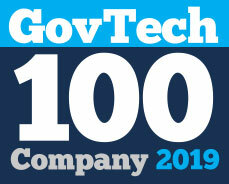 Is your city, county, agency or state ready for better? OpenBook now seamlessly connects to Questica Budget’s Capital Budget module bringing the ability for local governments to display capital projects on an interactive map. 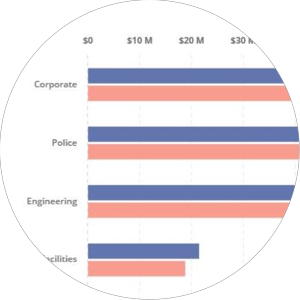 The OpenBook Project Explorer allows cities, counties, agencies and states to display on a map every infrastructure project, including the budget, actual spend, funding sources, and accompanying documentation, images, video, etc. Governments can also link related activities to showcase the depth and scope of capital projects that are happening in a city, region, state/province or country. By sharing your city, county, agency or state’s information in user-friendly format. Work with internal partners like council members, senior administrators and staff. Or connect with your citizens, businesses, community leaders and media. Give stakeholders access to the information they’ve been looking for. With OpenBook data is free to go where you need it. You can embed it in charts on websites, share it through social media, or access it through a smartphone. Quickly upload a dataset and start a visualization. To make your setup seamless, OpenBook integrates to Questica Budget and supports any other data source. Plus, there are training videos and built-in guided tours to enhance the learning experience. Questica Budget and OpenBook seamlessly integrate with Balancing Act’s budget simulation tool. 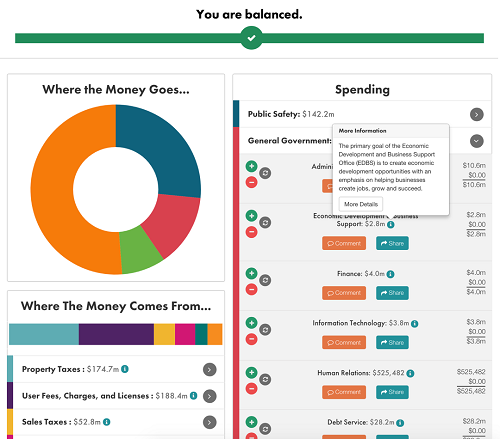 Balancing Act is the leader in public sector participatory budget simulations and taxpayer receipt software. We take incredible pride in delivering an exceptional customer experience for each of our customers. Our goal is to get your city, county, agency or state up and running with little to no disruptions. Throughout the process, we listen, adapt and always uncover ways our tools and technologies can improve your organization’s outcomes and enhance our future offerings. We’re proud to be recognized by Government Technology News on their annual GovTech 100 index (2019 *part of GTY Technology; 2018), which showcases the 100 leading companies serving state and local governments in unique, innovative and effective ways. 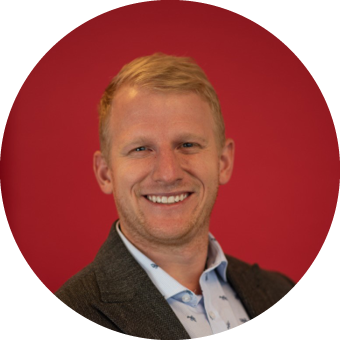 Connect with one of our OpenBook experts. Our team is full of friendly technology experts, budget professionals and business specialists that are ready to help you with our software solutions. 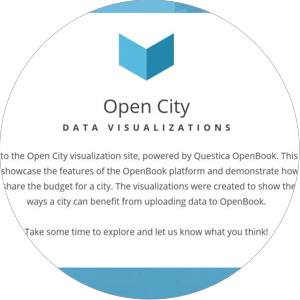 They can show you how Questica Openbook can help your city, agency or state share and engage with data through a personalized demo or sign-up for one of our free information sessions. The next one’s on May 15, 2019. “The Questica support team is very quick to respond to queries, and have always offered to work directly with other program vendors to fix an issue rather than pass the buck. Questica was also very willing and helpful in customizing our environment to meet our needs”.